You've made your arrangements and everything is ready for your special day. You just seem to be missing something. 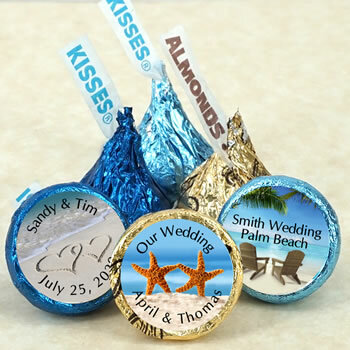 The beach themed Hershey kiss wedding favors are the perfect finishing touch for any decor. Adorable in their silver wrapping, you can personalize these tiny treasures with your names on nine different beach images. Whether you sprinkle them on the table or add them to a basket of other treats, the beach themed Hershey kiss wedding favors are sure to make your guests smile.